The variable loading floor makes handling of bulky items of luggage easier. The maximum permissible load of the variable loading floor is 75 kg. The room under the variable loading floor can be used to stow objects. Lift up the part with the grip and secure it by sliding it into the grooves marked with the arrows » Fig. 67. Unlock the variable loading floor by turning the securing bolts A around 180° anticlockwise » Fig. 68. 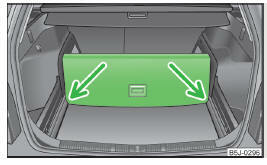 Fold up the loading floor by moving it in the direction of the arrow B . Fold up the variable loading floor and place it on the carrier rails. Fold out the variable loading floor. Lock the variable loading floor by turning the locking bolt A to the right by approx. 180°. Ensure that the carrier rails and variable loading floor are correctly fastened when fitting the variable loading floor. If this is not the case, there is a risk of injury for the occupants. Undo the securing points B » Fig. 69 on the carrier rails using the vehicle key or a flat screwdriver. Grasp the carrier rail A at position 1 and slacken it by pulling in the direction of arrow. You can take out the removable storage compartments in order to facilitate the removal » page 84, Storage compartments in the boot. Grasp the carrier rail A at position 2 and slacken it by pulling in the direction of arrow. The carrier rail on the other side of the luggage compartment can be removed in the same way. Position the carrier rails on the sides of the boot. Press the two securing points B » Fig. 69 on each carrier rail to the stop. Check the attachment of the carrier rails by pulling it.